Fifth Third Bike the Drive is a fantastic event for families. Get some quick tips on how you can enjoy the view while traveling at a leisurely pace with your family. One of the best features of the event is getting to ride with all the great people. Get some pointers on staying safe while riding, polite biking and what to bring on the ride. 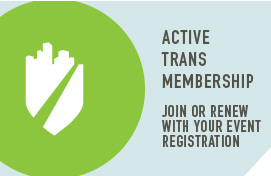 At Active Transportation Alliance, safety and security is a primary focus for all our events. We work together with the Chicago Police Department and city of Chicago officials to produce a safe, fun and enjoyable experience. 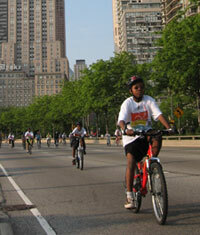 Uniformed Chicago Police officers are assigned throughout the festival grounds and along the biking route. This event is a family-friendly, public gathering; possession of firearms is prohibited at this event. Personal backpacks, bike baskets and panniers must remain on your person and in your possession at all times (not mounted to your parked bike). Do not leave backpacks or bags unattended at any time. Unattended bags will be immediately assumed to be a security risk. No bag check is available at the festival site. We recommend you avoid bringing excessively large bags or backpacks. Do not comply if someone asks you to watch his or her property. ALL participants MUST wear their registration materials for the duration of the event and at the festival. These include rider and helmet numbers and a wristband. Please report any suspicious packages or activity to event officials or volunteers. If you see something, say something. You can identify Volunteer Managers by their orange polos and Volunteers by their green colored event t-shirts. We have three ambulances stationed along the route, as well as more than 40 ride marshals, dozens of course marshals and multiple Support and Gear (SAG) vehicles. We also coordinate with Chicago Police, Chicago Fire and Traffic Control Aides who support the event. Our trusted SAG drivers will transport injured or distressed riders (those who do not need medical assistance) and their bikes to the start/finish.